"X" marks the spot! After 52 years at Hara Arena and its entire 64-year history in the Greater Dayton area, HamventionÂ® announced on August 1 that it would relocate to the Greene County Fairgrounds in Xenia, Ohio. The new venue is about 16 miles east of downtown Dayton off US Route 35 and north of Xenia. On June 29, the Amateur Radio community was stunned to learn that Hara Arena would shut down at the end of August, leaving Hamvention homeless -- at least until this week's big reveal. "We appreciate and value all the time and effort the many partners, in particular the Greene County Agricultural Society, the Greene County Board of Commissioners, and the Greene County Convention & Visitors Bureau, have put into helping Hamvention find the right venue to continue our long history here in the Miami Valley," Hamvention General Chair Ron Cramer, KD8ENJ, said on August 1. "We look forward to a long and mutually prosperous relationship." Cramer has said that Hamvention spent "many hours over the last few years evaluating possible [new] locations," and he has assured visitors that their "current accommodations and outside events already planned for Hamvention 2017 should not be affected." Hamvention chief spokesman and board member Mike Kalter, W8CI, made clear that the move to Xenia was not done in desperation. "Montgomery County didn't have anything for us," he told ARRL. "We looked exhaustively." "The key thing is that we plan to have a 5-star event," he said of Hamvention 2017. "We'll put a lot of time and energy into it." The move to Xenia could prove to be a huge economic bonanza for the city and for Greene County. 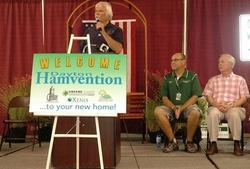 Hamvention attracts some 25,000 visitors each May. Its annual economic impact has been estimated at between $15 and $17 million to the Dayton/Montgomery County area, and some -- if not most -- of that benefit now could migrate eastward down US 35. Kalter conceded that the new venue in Greene County is a slightly longer drive from downtown Dayton -- where some Hamvention-related events traditionally occur -- than it was to Hara Arena, but he believes it will be worth the trip. James M. Cox International Airport in Dayton remains the closest for anyone flying in for the event, although the drive from the airport will be about twice as long for those deciding to stay in Xenia. "We expect next year to be a big year," Kalter said. "We expect a lot of people to come to see what it's like." Read more. Also see this story. On his website, KE9V has offered some first-hand information regarding the new venue. The FCC has proposed to revise the Amateur Service Part 97 rules in response to the ARRL's so-called "Symbol Rate" Petition for Rule Making (RM-11708), filed in late 2013, and it has invited comments on its recommended changes. The Notice of Proposed Rule Making (NPRM) in WT Docket 16-239, released on July 28, had been making the rounds at the FCC since May. ARRL had asked the FCC to change the Part 97 rules to delete the symbol rate limit in Â§97.307(f) and replace it with a maximum bandwidth for data emissions of 2.8 kHz on amateur frequencies below 29.7 MHz. 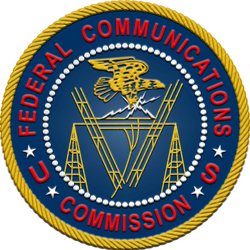 "[W]e believe that the public interest may be served by revising the Amateur Service rules to eliminate the current baud rate limitations for data emissions, consistent with ARRL's Petition, to allow Amateur Service licensees to use modern digital emissions, thereby furthering the purposes of the Amateur Service and enhancing the usefulness of the service," the FCC said in its NPRM. "We do not, however, propose a bandwidth limitation for data emissions in the MF and HF bands to replace the baud rate limitations, because the rules' current approach for limiting bandwidth use by amateur stations using one of the specified digital codes to encode the signal being transmitted appears sufficient to ensure that general access to the band by licensees in the Amateur Service does not become unduly impaired." While tentatively concluding that a specific bandwidth limitation for RTTY and data was not necessary, the FCC nonetheless invited comments on whether it should set emission bandwidth standards for Amateur Service MF/HF RTTY and data emissions. Under the current rules, "specified digital codes" in Part 97 may be used with a symbol rate that does not exceed 300 baud for frequencies below 28 MHz, with the exception of 60 meters, and 1200 baud in the 10 meter band. The baud rate limits were adopted in 1980, when the FCC amended Part 97 to specify ASCII as a permissible digital code. Comments in the proceeding will be due 60 days after the date that the NPRM appears in the Federal Register. "Magnetic Loop Antennas" is the topic of the current episode of the "ARRL The Doctor is In" podcast. Listen...and learn! If you've never listened to a podcast before, download our beginner's guide. Coming up next: "SWR." The ARRL National Parks on the Air (NPOTA) program now is in its 8th month, and more than 440 of the 484 eligible NPS units have been activated, with over 540,000 QSOs confirmed in Logbook of The World. Despite a rough summer for propagation, plenty of Activators have been on the air, and it's not too late for you to become a new Activator or Chaser. The 100th birthday of the National Park System is August 25, and several parks will be active during the Centennial week. See the NPOTA Facebook group for a list of stations active during the actual Centennial week, or to register your own activation. There are 31 activations scheduled for August 4-10, including two of the rarest units: President's Park in Washington, DC, and Touro Synagogue in Rhode Island. Do not miss out! The FCC has imposed fines on radio amateurs in California and Georgia after concluding they broke FCC rules and the Communications Act. The FCC Enforcement Bureau imposed a $25,000 penalty on William F. Crowell, W6WBJ (ex-N6AYJ), of Diamond Spring, California, for intentionally interfering with the transmissions of other radio amateurs and transmitting prohibited communications, including music. The forfeiture represents the full amount proposed in a December 2015 Notice of Apparent Liability for Forfeiture (NAL), and, the FCC said in a lengthy August 2 Forfeiture Order (FO), "is based on the full base forfeiture amount as well as an upward adjustment reflecting Mr Crowell's decision to continue his misconduct after being warned..."
"Mr Crowell does not deny that he made the transmissions that prompted the NAL in this proceeding, but argues, in large part, that those transmissions were protected by the First Amendment of the Constitution," the Forfeiture Order said. In mutiple responses to the NAL, Crowell not only argued that the enforcement action was directed at the content of his transmissions, which were protected by the Constitution, but were justified on the basis of other operators' actions. "Alternatively, Mr Crowell maintains that someone else caused the interference or transmitted the prohibited communications at issue in this proceeding," the FCC said. "It is well-established that regulation of radio in general does not violate the First Amendment or [the Communications Act]," the Commission's Forfeiture Order said, "and courts have made clear that this conclusion applies to the Amateur Service as well." The Enforcement Bureau recounted that its agents and the High Frequency Direction Finding Capability Center (HFDFC) monitored Crowell's transmissions on August 25 and 27, 2015, during the WARFA Net on 3908 kHz. They observed Crowell's Amateur Radio station "intentionally interfering with other amateur licensees by transmitting on top of other amateurs, and repeatedly interrupting amateurs using noises," the Forfeiture Order said. The Enforcement Bureau concluded that Crowell "willfully and repeatedly" violated the Communications Act and FCC rules "by intentionally causing interference to other Amateur Radio operators and transmitting prohibited communications, including music." The Bureau said that after reviewing Crowell's arguments, it found no reason to cancel, withdraw, or reduce the penalty it had proposed last December. Read more. In a Forfeiture Order released on July 29, the FCC fined David J. Tolassi, W4BHV, of Ringgold, Georgia, $1000 for failing to properly identify. The FCC had proposed the fine 1 year ago in a Notice of Apparent Liability for Forfeiture (NAL), noting that Tolassi had been warned the previous summer about not following Part 97 ID rules. The FCC said at the time that Tolassi's "deliberate disregard" of the earlier warning warranted the proposed penalty that it reaffirmed this month. The FCC said Tolassi did not deny transmitting on 14.313 MHz on the date in question, but he argued that his comments were within the 10-minute window mandated by the rules. The FCC disagreed, however, noting that Tolassi never identified during 15 minutes of transmissions that agents had monitored. Tolassi had requested the FCC cancel the NAL and substitute a Warning Letter, asserting that the FCC has issued multiple warnings before imposing fines in similar cases. Tolassi was not being treated any differently than other licensees have been, the FCC countered. Read more. At its July 2016 meeting, the ARRL Board of Directors approved revisions concerning the management and governance of its National Traffic Systemâ¢ (NTS) program. In response, some NTSâ¢ participants have proposed to form a new organization with the stated purpose of engaging in current NTS activity, independent of ARRL. This action, in part, was a reaction to ARRL's announcement regarding the creation of an enhanced emergency communications plan, scheduled for implementation later this year. The ARRL plan will address the role of programs such as NTS, which can provide important capabilities to ARRL partner agencies, including the Federal Emergency Management Agency (FEMA), the American Red Cross, and The Salvation Army. In a statement issued August 3 by ARRL, the League said it believes that the existing ARRL NTS program will rise to meet these new, demanding requirements; NTS resources are already well-established networks and have a long history of reliable operation. "We encourage all NTS participants to be involved in current National Traffic System activities by continuing their existing assignments and duties," the statement said. "However, if NTS members wish to explore alternative programs like the one recently proposed, we do not wish to discourage that exploration." The statement went on to say that it is ARRL's mission to support all activities that advance the art, science, and enjoyment of Amateur Radio. The League "encourages any activity that strengthens the national emergency communications infrastructure, provides network redundancy, and refines and maintains the critical skills of radio amateurs who daily serve their communities with communication training activities and responses to local and regional emergencies," the statement concluded. The FCC is inviting comments on a June 11 request from Expert Linears America LLC to waive Â§97.317(a)(2) of the Amateur Service rules to permit it to import, market, and use its model 1.3K FA amplifier in the US. The Texas company is seeking the waiver pending resolution of its earlier Petition for Rule Making (RM-11767), which called on the Commission to eliminate the 15 dB gain limitation on Amateur Radio amplifiers altogether. Expert said the version of the model 1.3K FA amplifier it now imports has been modified to comply with current rules. "Expert seeks a waiver in order to be able to import the unmodified version of the Model 1.3K FA, which is capable of considerably more than 15 dB amplification," the FCC explained in a July 29 Public Notice. "Expert argues that the public interest would be served by permitting use of a higher-powered amplifier, because it would improve the communications capabilities of amateurs using portable, low-power transmitters by enabling them to approach the maximum legal power output." Expert assured the FCC that its model 1.3K FA has proprietary software to prevent it from transmitting in the 26-28 MHz band, so it cannot be used in the Citizens Radio Service. On May 26, ARRL told the FCC that it "strongly supports" Expert's petition seeking to eliminate the Amateur Service rule, spelled out in Â§97.317(a)(2), that amateur amplifiers not be able to boost the RF input signal by more than 15 dB. Comments on Expert's waiver request are due by August 29, reply comments by September 13. US Department of Defense (DOD) Military Auxiliary Radio Service (MARS) operators in the US, Germany, and Japan, will take part in an interoperability communications exercise on Monday, August 15, from 1200 UTC to 2359 UTC. The focus of the exercise is "to train during a simulated communications-constrained environment using radio-only communication capabilities," MARS said. Throughout the exercise, MARS operators will reach out to and attempt connect with Amateur Radio operators at the local and regional levels using HF, VHF, and UHF. For the purposes of this exercise, the use of the 60 meter interoperability channels -- dial frequencies 5330.5 and 5346.5 kHz -- are authorized and encouraged. Other bands will be coordinated by MARS members at the local/regional level with their ARES/RACES/club counterparts. Amateur Radio Newsline has announced that 17-year-old Skyler Fennell, KD0WHB, an ARRL member from Denver, Colorado, is the 2016 Bill Pasternak, WA6ITF, Memorial Young Ham of the Year (YHOTY). The recent Denver School of the Arts honors graduate and Amateur Extra licensee was introduced to Amateur Radio when he was a high school freshman, but his interest in electronics began in 4th grade. YHOTY winner Skyler Fennell, KD0WHB, with his bicycle mobile. "After starting an Amateur Radio club at my high school, we all wanted to be part of a high-altitude balloon launch," he explained on his QRZ.com profile. "After fundraising, and a number of designs, we finally launched with the Edge of Space Sciences (EOSS)." He worked with the EOSS Amateur Radio-equipped balloon launches of the AB0BX STEM School Amateur Radio Club in nearby Littleton. Skyler's interest in satellite communication resulted in a revival of the Colorado Amateur Satellite Net; he became a net control operator and created a website for the net. He also has gained extensive experience designing and working on repeater systems, and introduced the AllStar Link system for one of the Rocky Mountain Radio League's repeaters. He became project manager for its 440 MHz repeater and helped put together an AllStar and EchoLink repeater for students. He was also involved in proposing and assisting in the construction of a VHF/UHF repeater at a remote mountaintop site and added an AllStar link to the system. Danish Ham-Cyclist Thomas Andersen, OZ1AA, now is in North Africa and soon expects to be in Europe on the last leg of his "Cycling the Globe" bicycle journey. He anticipates being back home in Denmark within a few months. 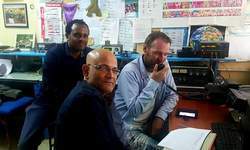 Round-the-world cyclist Thomas Andersen, OZ1AA (right), took some time out in Addis Ababa, Ethiopia, to operate ET3AA. "I'm currently in Morocco and ready to cross over to Spain," he told ARRL on August 2. "From there I will cycle through Spain, France, and Germany back to Denmark. It will take 2 months." Andersen said that, while he had hoped to, he did not do much hamming while in Africa, but he did visit the ET3AA radio club in Addis Ababa, Ethiopa. "That was a great experience," he said. "It was a great time there, meeting the students and making a few QSOs." Andersen typically can cover 60 miles in a day, but he's done as many as 100 miles. He began his cycling adventure in Copenhagen 6 years ago. While he does carry a VHF/UHF FM handheld, Andersen said he really has not used it that much. He told ARRL that he hopes to be on the air "from somewhere on my way up through Europe." Andersen, who was in the US a year ago, said he purchased a new mountain bike "with fat tires" for the trip through Africa. "It was a good choice, since there have been a lot of rough dirt roads here," he told ARRL. "This bike is the third I've used on my trip around the world." Technical Papers are invited until August 12 for presentation at the 35th Annual ARRL/TAPR Digital Communications Conference (DCC), to be held September 16-18 in St Petersburg, Florida. Papers will be published in the Conference Proceedings, and authors do not need to attend the conference to have their papers included. Submit papers to via e-mail or via post to Maty Weinberg, KB1EIB, ARRL, 225 Main St, Newington, CT 06111. Papers will be published exactly as submitted, and authors will retain all rights. 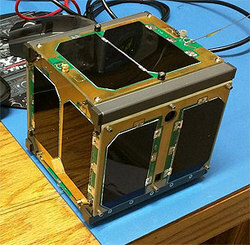 AMSAT-NA Vice President-Engineering Jerry Buxton, N0JY, reports that the Fox-1B CubeSat (RadFxSat -- Radiation Effects Satellite) flight unit has been assembled and now is undergoing various stages of testing before it is put through environmental (shock, vibration, thermal) testing in August for completion by early September. Launch is scheduled for January 20. Fox 1B is a joint mission by AMSAT and the Institute for Space and Defense Electronics at Vanderbilt University. It hosts a technology experiment by Vanderbilt University as well as an analog FM Amateur Radio payload. During a recent test stop in Fox Labs, most of the testing was streamed live on YouTube (archived) to give enthusiasts an opportunity to look over Buxton's shoulder as he conducted tests on the flight unit along with other Fox Engineering Team members. Fox-1B (RadFxSat) is expected to be back in Fox Labs around August 11 for another round of tests, and live streaming will be available during those tests as well. 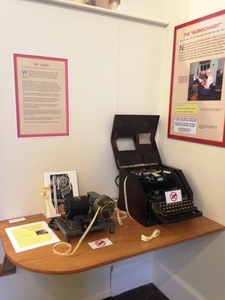 ARRL member Gene Greneker, K4MOG, of Powder Springs, Georgia, recently fulfilled a dream for the Chatham Marconi Maritime Center museum -- formerly WCC on Cape Cod -- to add an important artifact to its collection. 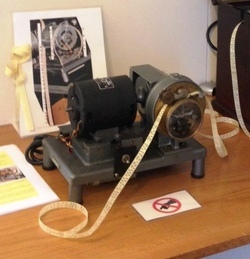 Greneker spotted a brief item in QST last year seeking a so-called "Creed machine" for the museum. While most ship-to-shore station traffic was conducted by skilled Morse operators at their keys, the Creed machine -- or keyer -- read a punched tape prepared in advance that generated one-way Morse code broadcasts to ships at sea. "We have searched continuously for roughly 10 years for this artifact, following leads with historians, other museums, archivists, ham radio operators, collectors, and any other possible leads," said Chatham Marconi Maritime Center Operations Manager Dorothy Bassett. The mention in QST, resulting from a visit to the museum by ARRL Lab staffer Mike Gruber, W1MG, did the trick. Greneker spotted it and let Bassett know he had what she was seeking. "Our members and supporters raised the funds, and we were able to purchase the Creed machine, a custom table, and an entire exhibit to showcase this item and how it worked with our Kleinschmidt machine," Bassett recounted. The Kleinschmidt machine -- or "Klein" -- refers to the equipment used to create the punched "Wheatstone" tape, the narrow ribbon of heavy, perforated paper read by the Creed keyer. Bassett said that once the exhibit is complete, the museum plans to install a button that visitors can push to start the machine, "so guests will get to hear the Creed working, see the tape move, and watch the pins and mechanics in action." A closer look at the Creed keyer. perforator," Greneker told Bassett. "Given that there were not that many shore-to-ship stations, not many Creed keyers were ever manufactured." Greneker said the machines were assembled by hand and expensive to purchase. He speculated that the Creed machine he donated may once have been at WCC. "RCA was famous for taking old equipment from the flagship station (WCC) and sending it to the smaller stations when they needed some item. The flagship station then got the new replacement equipment," he explained. Greneker explained that when shore station operators such as RCA closed those facilities, "the entire station was loaded up and carried to the dump, making the keyers almost impossible to find today." "This piece is very special to us," Basset said, "and I can't thank the ARRL enough for running the ad that secured procurement." Tad Cook, K7RA, Seattle, reports: Average daily sunspot numbers dropped from 19.3 last week to 10.7 for the current July 28-August 3 reporting week. Average daily solar flux declined from 82.5 to 72.1. Geomagnetic indices were more active this week, with average daily planetary A index increasing from 8.7 to 13, and mid-latitude A index rising from 8.9 to 11.9. Sunspot numbers were low all week, and on Wednesday, August 3, the sunspot number dropped to zero. The predicted solar flux is 75 on August 4; 80 on August 5-6; 85 on August 7; 90 on August 8-9; 95 on August 10-15; 90 on August 16-17; 85 and 80 on August 18-19; 75 on August 20-22; 70 on August 23-27; 72 on August 28-30; 75 on August 31; 85 on September 1; 90 on September 2-3, and 95 on September 4-11. Predicted planetary A index is 15 on August 4-5; 10 on August 6-7; 20, 8, 12, 10, and 8 on August 8-12; 5 on August 13-14; 12 on August 15-16; 5 on August 17; 8 on August 18-19; 5 on August 20-23; 15 on August 24-25; 5 on August 26-27; 8 on August 28; 20 on August 29-30; 15 on August 31; 12 on September 1; 10 on September 2-3; 8 and 5 on September 4-5; 12 on September 6-7; 8 on September 8, and 5 on September 9-10. Sunspot numbers for July 28 through August 3 were 13, 13, 13, 12, 13, 11, and 0, with a mean of 10.7. The 10.7 centimeter flux was 70.3, 70.5, 71, 71.5, 71.9, 74.9, and 74.8, with a mean of 72.1. Estimated planetary A indices were 15, 14, 6, 3, 3, 17, and 33, with a mean of 13. Estimated mid-latitude A indices were 13, 16, 7, 2, 4, 17, and 24 with a mean of 11.9.